"But students and physicians, throughout their years of training, need appropriate learning opportunities and practice to address death, dying, and the human experience of medical practice. Unfortunately, the "hidden curriculum" of contemporary medicine — especially the hurried, disease-centered, impersonal, high-throughput clinical years — still tends to undermine the best intentions of students and faculty members and the best interests of patients and families. Medical schools, residencies, and continuing medical education programs can help learners and their patients by investing in expanded training in palliative care and by hiring and training faculty members who, at all stages of medical training, can model and teach these fundamental skills." Well said. There's also an 8 minute interview with a medical student and Susan Block about the course which is worth listening to. This week's J of Clinical Oncology has a few articles to note. 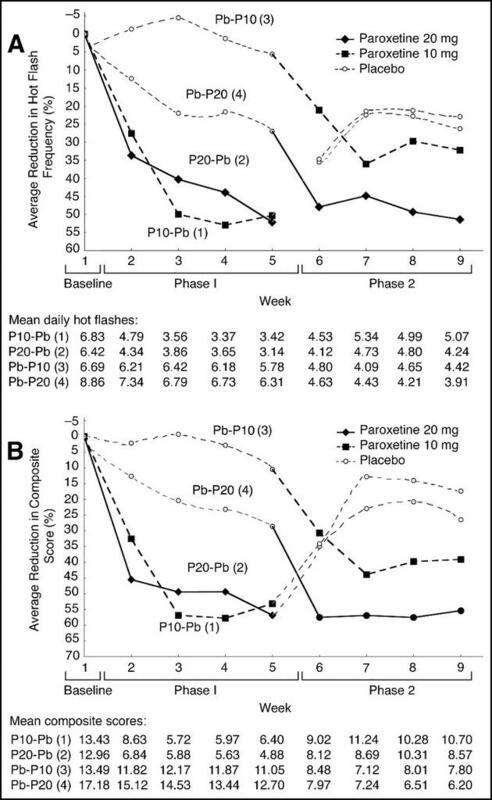 First is a randomized & placebo controlled trial of 10 or 20mg of paroxetine to treat hot flashes (many, but not all, of whom had had breast cancer). It employed what seems to be a needlessly complicated double cross over design which lead to phenomenally complicated figures such as the one below. Edward Tufte would not approve. If anyone understands why they chose this study design let me know. 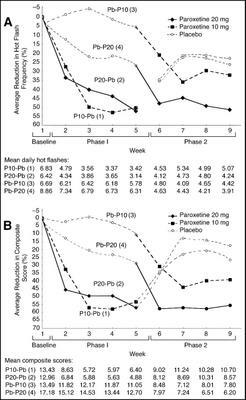 Nevertheless hot flashes did decrease in the paroxetine groups by ~40-50% & the difference was apparent within the first couple of weeks. Interestingly there were no real differences on quality of life (using several scales) between groups--people did sleep a little better with paroxetine though. 10mg was overall better tolerated (markedly less nausea than the 20mg) & preferred by the patients. I'll also point out that besides the good folks at GlaxoSmithKline, a grant from the "Fashion Footwear Foundation/QVC Presents Shoes on Sale" people funded this study. There's also piece about mental health problems amongst caregivers of patients with cancer. Briefly--13% of those studied probably met DSM-IV criteria for a psychiatric condition & 25% had sought some help for mental health reasons. However only 65% of those caregivers contacted participated in the study & there's no real comparison group. Also the cancer patients had to be able to give consent so presumably the caregivers of many of the sickest patients were excluded. What was most disturbing in some ways was that of those with psychiatric disorders only half of those who had sought care for their problem prior to their loved-one's cancer diagnosis had sought care after the diagnosis was made suggesting perhaps this is an easy time for these people to fall through the cracks. Finally there was a review of acupuncture for chemo-related nausea, and a fascinating piece about presenting quality of life data to people in different graphical formats (lines vs. graphs etc.) that's a fine read. October's American J of Medicine has a brief report of a small blinded trial comparing IV lidocaine to placebo for cholestatic pruritis. 12 patients received 100mg IV lidocaine over 5 minutes (6 received placebo) & visual analogue scale recordings of pruritis were recorded for 7 days afterwards. Basically, there was a significant difference in itching on the 100mm scale (70mm before to 40mm afterwards on average) on days 2 and 3. There was essentially zero change in the placebo patients. Clearly the IV lidocaine had a salutary affect on itching--whether it is feasible (are people going to get q4day dosing of iv lido? ), whether the magnitude of the effect is worth the cost/risk, & whether alternative agents (mexilitine) are worthwhile remain to be seen. "Perhaps by reading these articles, one develops a broader "differential" regarding the meaning of death in individuals, regardless of their religion or lack thereof." Click on the comment link below the post to read it in full. Thanks Lyle. Lancet--end of life perspectives series continues with the Catholic view. Virulent C. diff may be emerging. "According to Pellegrino and Thomasma, the sense of finitude, vulnerability, loss of self, and destruction of a person's normal life that is experienced in illness can be transformed when a sacramental approach to medicine is taken. They note that the art of medicine is a human endeavour that imitates the beauty and creativity of God. In experiencing this art, the patient experiences transcendence rather than despair. In this way finitude is transformed. When physicians treat patients regardless of how the patient might have contributed to their own illness, and when they respond to the cry of the patient for help, vulnerability is overcome. When an attempt is made to treat the whole person, rather than focusing on bodily functions, personhood is restored. Finally, when the focus of medicine is to place the patient, even though he or she may be dying, back into the community where he or she has the opportunity to experience the love of those around him or her, the sense of disruption of life is attended to. All these components of healing function as signs of God's grace." There's also a brief article about an emerging epidemic strain of C. difficile in Quebec which appears to produce toxins A & B in quantities an order of magnitude higher than normal. This could drastically effect our patients' lives. The current BMJ has several opinion pieces about the current debate over euthanasia & physician assisted suicide (together called "assisted dying" in the BMJ). The occasion is the recent change in BMA policy no longer opposing assisted dying & a pending debate in the House of Lords about its de-criminalization. The many pieces in this issue address the history of the BMA and assited dying in the UK, the current debate, and present pro- and anti- opinions. Everything from most people & doctors in the UK want it therefore we should do it to legalizing euthanasia will endanger our disabled countrymen is present here. There does seem to be somewhat of a lumping of PAS and euthanasia here which may be appropriate to the debate in the UK although here in the US--at least amongst PAS's proponents--the distinction between the two is kept firm. Although I can't imagine myself performing PAS I don't think it should be a criminal offence. And while I can't at all accept the morality of euthanasia, those who argue that true terminal sedation (deliberately knocking someone out & keeping them down until they die to control advanced symptoms) is not that removed from euthanasia make a certain amount of sense, especially for those of us who believe what makes us human is our mind and the ability to relate/interact with other members of our species. The difference, however, is that it seems that in both the Dutch euthanasia experience & the Oregon PAS experience, most people seeking assisted dying don't do it as an escape from advanced symptoms but because they are afraid of advanced symptoms, losing control, etc (or they're frankly depressed). This is, in a sense, a form of existential suffering, & is that then sufficient reason to comply with requests for assisted dying? The current J of the American Geriatrics Society presents a randomized controlled trial of prophylactic haldol to prevent delirium in elderly hip fracture patients. They randomized about 400 people >70 years old to haldol 0.5mg tid or placebo at the time of hospital admission & continued the haldol for 3 days after surgery; those who developed delirium were treated with a protocol using haldol & (interestingly) lorazepam; those who were assessing the patients for delirium were blinded to allocation; intention to treat analysis was used. Rates of postoperative delirium were identical between groups (15%)--however the delirium was briefer (5 vs 11 days) and less severe in the haldol group, and the length of hospital stay (for those patients were developed delirium) was much shorter (17 vs 22 days) in the haldol group. They state there were no treatment side effects from the prophylaxis but that seems really unlikely especially since there was no formal side effect assessment--they did state there were no extrapyramidal reactions observed. This isn't exactly palliative medicine research but I think any randomized trial involving antipsychotics for delirium is of note since it is such a common practice in our lives & quality clinical trial data are sparse. I will also commend this article for its use of the term "morphinomimetics." J of Clinical Oncology recently published a review of the management of brain metastases. It covers whole brain radiation, surgery, stereotactic radiosurgery, radiosensitizers, and future directions. As a non-oncologist I found it nicely informative & it would make good teaching material. The prognosis for patients with brain metastases is poor. Overall, median survival of brain metastases patients is about 4 months after whole-brain radiation therapy (WBRT), but it varies based on several prognostic variables. For example, in a study of 740 brain metastases patients, the actuarial 2-year survival rate was 8.1%, but it ranged from 1.7% for brain metastases patients with small-cell lung cancer to 23.9% for those with ovarian cancer. Factors that predict for better survival include good performance status, age younger than 65 years, successful control of the primary tumor, absence of extracranial metastases, favorable tumor histology, and presence of a solitary brain metastasis. July's J of the American Geriatrics Society has a piece about racial differences in the US in end of life care . It is based on interviews with decedents identified from a US death certificate database & has all the problems associated with post-mortem interviews. Nevertheless their findings are generally in line with previously described differences between African-Americans and whites w/r/t end of life care and medical care in general. The decedents of the African-American patients reported more communication and accessibilty problems with physicians, more problems with lack of support of support of the family, less use of advanced directives, more financial burden from the death, and more use of 911 services, respirators, and feeding tubes in the last month of life. Interestingly, perceived symptom control was similar across groups. African-Americans were more likely to be cared for by a family member at home in the last month of life. The current Lancet continues its series on end of life perspectives from different faiths with the "traditional" Christian view. We will have to wait for the less-than-traditional Christian view before it's clear what the authors mean by "traditional." I have to admit I love the idea of this series but am getting a little disappointed with it. This is supremely unfair & probably stems from my desire to get some good meaty answers to make things all-A-OK when I enter the room of someone from a different culture and faith tradition from me (which is probably most rooms). This is clearly stupid. On the other hand, and in contradistinction to the desire expressed above, it seems to me that the differences between patients and families within a culture or tradition are often just as great as the general differences between people from different traditions and, as a palliative care consultant, you have no idea what you're walking into when you enter that patient's room to talk about death. Anyway, I'll end with a quote from the Lancet article: We will all need to acknowledge that our culture is rent by profound religious and moral disagreements. Much of the public debate during the last 15 years has suggested that euthanasia and PAS are just another type of withdrawal or withholding of life-sustaining treatments. However, the empirical data strongly suggest that requests for euthanasia or PAS are less like traditional requests for the withdrawal and withholding of life-sustaining interventions than like plain old suicide. Like terminating life-sustaining treatments, euthanasia and PAS are intended to end a patient's life when it is causing more suffering and do so at the patient's request. However, this does not appear to be what actually occurs in cases of euthanasia or PAS. Instead, requests for these interventions tend to be guided by psychological distress rather than rational choices about a good death. This conclusion should be especially worrisome given that approximately 15% to 25% of cancer patients are depressed, and approximately 80% of requests for euthanasia or PAS come from cancer patients. When the depression thesis is juxtaposed with epidemiologic data demonstrating that, in general, suicide is approximately 30% to 50% more likely among cancer patients and that depression is a primary motivation for suicide, euthanasia and PAS look more like a method of acting on suicidal ideation than a type of termination of medical treatment. The American Heart Association and American College of Cardiology have released their revised guidelines for the diagnosis & management of chronic heart failure (free full text .pdf here). There is a brief section at the end on end of life and palliative care for the heart failure patient. It is eminently reasonable & based, of course, on all "level C" evidence; it is also substantially longer than the 2001 guidelines section on end of life. A couple comments.... One is that the idea of inotropes for symptom relief for dying patients is being mentioned (both in the summary below as well in the longer text afterwards). Mentioned but not (yet) endorsed--but I wonder if in the next few years this will become an increasingly utilized (& hopefully critically studied!) intervention especially as it's more & more available in the outpatient and home settings. The other is to note this statement: "Physicians caring for these patients should become familiar with the prescription of anxiolytics, sleeping medications, and narcotics to ease distress during the last days." Perhaps it's careless language (& this language was in the 2001 statements) but one hopes the use of anxiolytics, sleeping medications, and narcotics to ease distress are not viewed as interventions reserved for the last days of people's lives! The current Archives of Internal Medicine takes a look at parkinsonism from newer vs. typical antipsychotics. It's a retrospective cohort study of elderly (>65 years old) demented Canadians using a public administrative database. Basically they compared people given typical vs. atypical vs. no antipsychotics & then looked at rates of diagnoses of parkinsonism or prescriptions for antiparkison drugs. Despite these obvious problems it's a worthwhile article. What's of note is that they found that rates of parkinsonism were similar between those taking high-doseatypicals & those taking typicals--the event rates were ~5 per 100 person-years. See the table for their definitions of high doses (I am experimenting with adding images to the blog & 1)am not sure if what I've done here is legal, & 2)am not sure if this looks good or is worth the effort). They note about 80% of the atypical use was risperidone & I'll note that 2mg a day of risperidone is not an atypical dose. All this adds to the growing body of literature that the newer antipsychotics clearly are associated with significant extrapyramidal side effects. Click on the image for full-size. We excluded individuals receiving dialysis or palliative care, because these are potential contraindications to antipsychotic therapy [...]. Huh?? Briefly--the FDA approved extended release tramadol today & it's expected to reach the market early 2006. It's dosed once daily & will come as 100, 200, and 300mg. Here's the Reuters story. "If one who is sick ceases to take food with the intention of dying when medicine and nursing care are at hand, he commits a minor offence (dukkata). But in the case of a patient who has suffered a long time with a serious illness the nursing monks may become weary and turn away in despair thinking 'when will we ever cure him of this illness?' Here it is legitimate to decline food and medical care if the patient sees that the monks are worn out and his life cannot be prolonged even with intensive care." Spinal opioids necessitate intense monitoring in patients with progressive disease and reduced ability to attend the clinic. Subcutaneous tunnelled catheters necessitate fixation, need bacterial filters, site protection, limited tubing changes, and at least weekly exit-site care and close monitoring for infection. As patients become more homebound and transitioned to hospice home care, this approach becomes impractical. July's Chest has a piece looking at the quality of dying in the ICU (it's based on a retrospective survey of bereaved family members). 10 years after SUPPORT it appears that symptoms/pain are still very poorly controlled in the ICU for the dying. Besides pain control, what the families felt was most related to the quality of death were: feeling at peace with dying, keeping one's dignity and self-respect, and having control over what was going on around the dying patient. The last of those seems completely anathema to the whole ICU experience and structure; what would be interesting would be to explore what really it means to patients and families to have control over what was going on around the patient in the ICU. My guess is that it would be quite modest & achievable, especially for those that everyone accepts are dying (visiting; noise in the room; some control of who enters into the room; religious & cultural rituals, etc.). The current J of Clinical Oncology has a couple of articles on prognosis. One is a review of the evidence about prediciting prognosis in advanced cancer . The other presents a model for predicting survival in patients presenting with pathologic fractures with the goal of helping to delineate better who will actually benefit from going to the OR. There are no real surprises in either of these; performance status & clinicians' estimates of survival remain key. There's really not much in the orthopedic article to change the current practice of us physicians weighing things out and deciding who we'd think would benefit from surgical repair. There's also brief case-based review of artificial nutrition & hydration at the end of life; it would make a nice teaching supplement for those interested. The current Lancet continues their viewpoints series on the end of life from different religious perspectives with the Jewish view. The first in this series, which I originally missed, was a Hindu perspective. After reading 3 of these now I'm realizing they are too short, perhaps necessarily so, and I am left with more questions than answers. Anyway, it's notable that the author--who appears to be a member of the Conservative Movement--notes that in his opinion artificial nutrition and hydration are medicine & not food. The current JPSM has an article prospectively following hospice patients who were given antibiotics to see if antibiotics alleviated symptoms associated with the infections. About 1600 people were followed; 600 were treated with antibiotics for suspected or proven infections & symptoms were prospectively followed. Most infections were UTIs or respiratory. Except for UTI's, 50% or fewer patients had symptomatic improvement with antimicrobials (this included broad spectrum antibiotics such as quinolones for respiratory infections; nystatin and fuconazole for oral infections; as well as skin infections). 66-88% (varied by antibiotic) of the people with UTI's had improvement. The median mortality was at 30 days. Clearly there are lots of problems with this study (no real control let alone randomization; no clear definitions of infection [eg. 85% of the people given gatifloxacin for respiratory infections had no improvement which makes me think they either didn't have infections or were very close to death anyway]; how symptoms were assessed & how it was decided if symptoms improved or not are not described. Nevertheless it describes a very 'real world' process--patient has symptoms; doc wonders if it's an infection; patient gets antibiotics hoping it will make things better--and I think it's useful information that most people with most infections didn't improve with antibiotics. Their experience indicates however that people with suspected UTI's get relief with levofloxacin (88%) and TMP-SMX (78%)--the next logical step would seem to be randomizing hospice patients with suspected UTI's to symptom relief only (analgesics, antispasmodics, etc) or symptom relief plus antibiotics to see if there's any difference.